The Assemblée Nationale metro station platform looks like a large-scale painting from a modern gallery or museum. 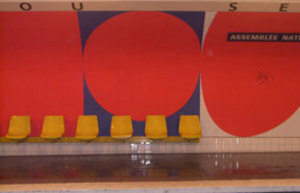 It’s walls with odd free form shapes in red, white, and blue and the yellow bucket seats in front of them, are an eye-pleasing exercise in primary colors. 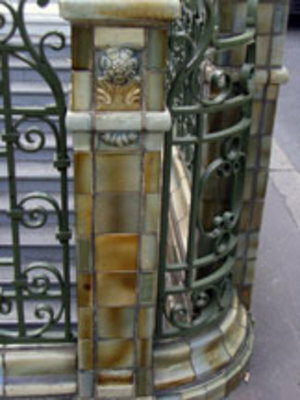 The contrast of the rich iron work in classic green in the entrance against the playful modern platform walls make for a most unusual metro station. 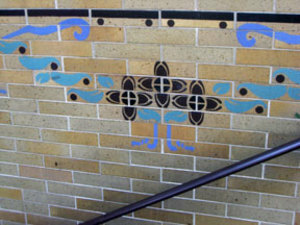 I noticed another unusual detail in that the tiles on the walls going down the stairs have designs etched on them rather than the usual carved tiles. Assemblée Nationale,known originally as the Palais Bourbon, is the French lower House of Parliament with 577 members known as deputes. Duchesse de Bourbon, daughter of Louis XIV commissioned the building, and was built between 1722 and 1728.The grand Roman portico was added in 1906.